Costumes Ghouls Rule. New costumes. 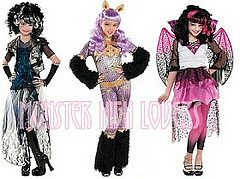 Wallpaper and background images in the Monster High club tagged: monster high frankie clawdeen draculaura. These are god awful, even worse looking then the dolls. Ummm there made for kids and it is not made by a professional so there ging to bad. And kids don't care if it looks bad so yha any who. I would wear Frankie's costume just for the black boots!!! ^More 80s, but i don't want to think even the 80s had something that horrid. Agreed^ wow Mattel get a hand of yourself! Yes I know these are custom.